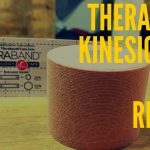 TheraBand’s kinesiology tape is actually a joint collaboration between Cramer, an established sports medicine brand established in 1914, and TheraBand, which is probably best known for their elastic resistance support products. 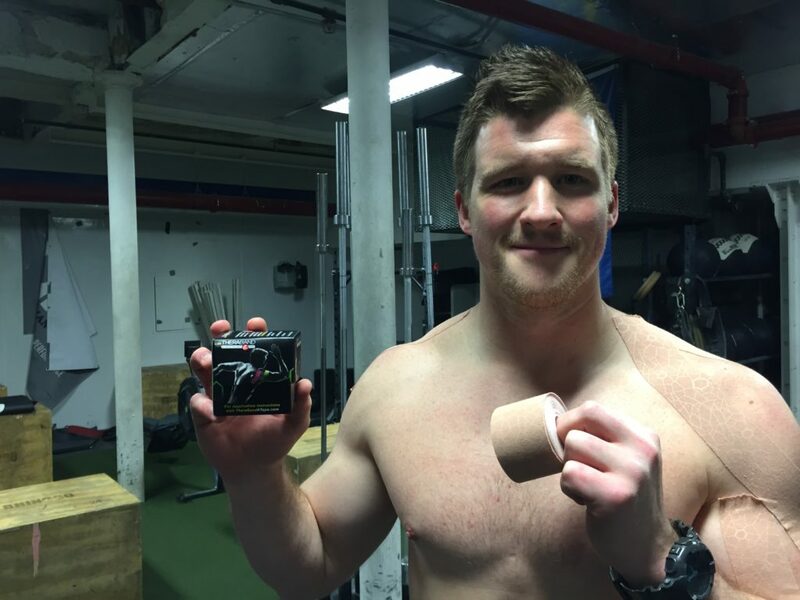 The two have come together to design a kinesiology tape that claims to not only be the “best-in-class adhesive tape” around, but also offer “the right fit, every time”, according to their site. I was able to snag a roll and was eager to see how this held up against sweaty, heavier, and intense training sessions. In this article we are reviewing the TheraBand kinesiology tape. Click HERE to shop TheraBand Tape. TheraBand kinesiology tape is one of the more non-synthetic supportive tapes I have worn, which left a noticeable, non-restricting feel on the body. 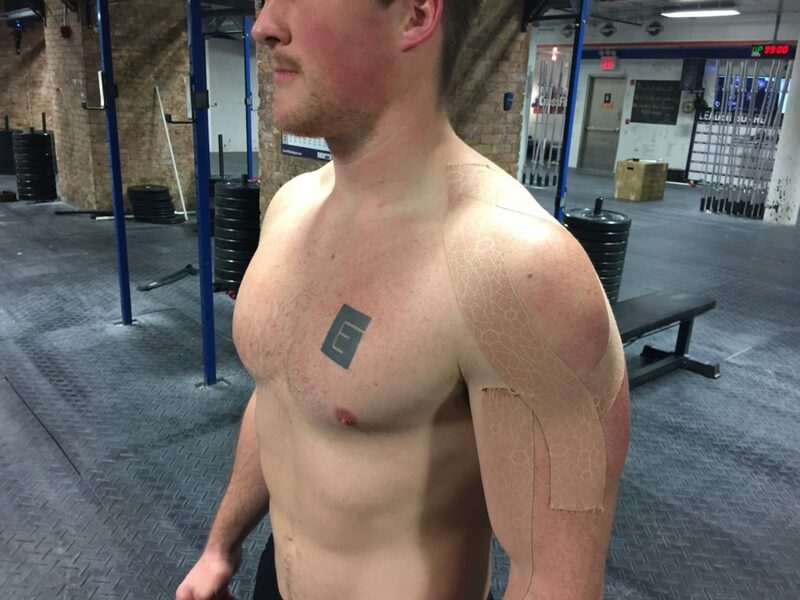 The adhesiveness allowed the tape to stay in place during the entirety of my warm-ups, explosive snatches, and overhead work, without any fuss. Applying the tape was quite easy, however there were specific instructions to follow to get “the best fit, every time” when applying the tape. 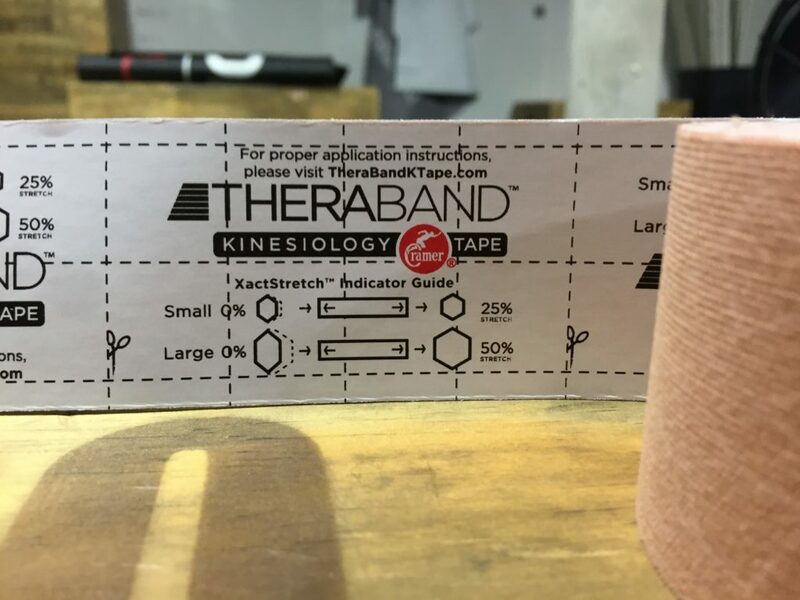 TheraBand has something called “Xact Stretch”, which basically are small and larger oval shapes printed on the tape, that will allow you to reference the sizes of them (they get bigger as stretch) to help you be consistent when applying the tape. The bigger the stretch, the larger the circle, and ultimately the more support the tape can offer. The instructions on the back of the tape made it easy to follow and was a pretty cool perk to have to take the guesswork out of the application process. The tape itself offered solid structural support, however was still less supportive than synthetic-based tapes. Personally, I found this to be a middle of the road tape, meaning that while it wasn’t highly supportive as compared to synthetic tape, it did offer more support than other cotton versions I have tried. Athletes and coaches looking for a tape that offers noticeable support without needing latex or synthetic versions may want to look into this tape. Others who are looking for basic, lightweight support may find that this tape may offer too much “feel”, and make find another cotton-based tape to fit their needs. 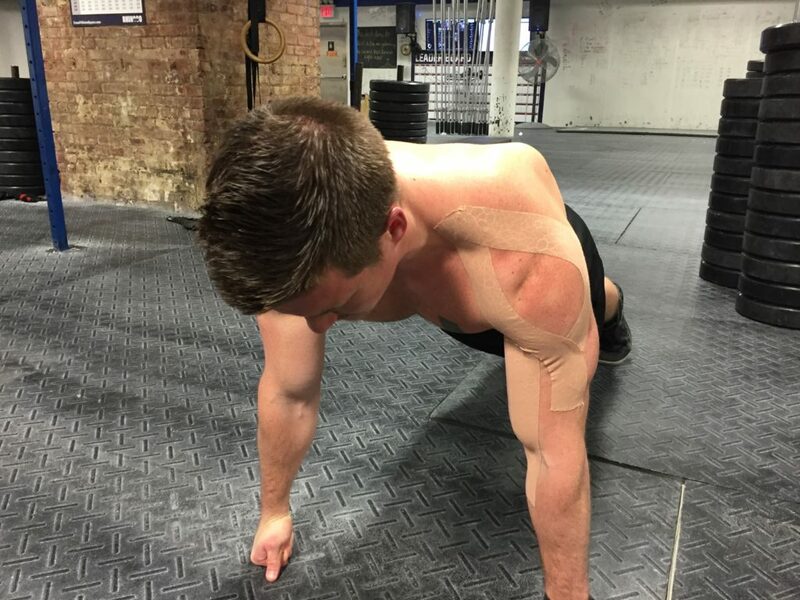 TheraBand kinesiology tape is comfortable on the skin, as the tape itself has 2% spandex, which means it can move, flex, and stay on the body longer than most. The tape itself, while being supportive, has a natural feel, one that doesn’t feel like I am wearing sticky, rigid tape (much like some synthetic versions). The tape is soft, smooth, and wears nicely on the body. The “XactStretch” technology does actually help with making sure you can get the right amount of support (25-50% stretch) across both sides of body, which is a plus when trying to get a uniform fit and feel. The specific roll that I had did not come pre-cut, however I found this tape to be very tear-able, and the additional markings on the back of the tape made it easy to measure lengths. I did see that they do sell both non-cut and pre-cut versions online, so you are left with both options. I applied the tape across the bicep/elbow, as well as on the upper trap and shoulder complex. The adhesiveness and support was good, and the 2% spandex really was beneficial as I performed full movements without restrictions. This material is comprised of latex-free cotton/spandex (98/2%) fibers, that are very stretchy allowing for full ranges of movement. The spandex was noticeable in the best way possible, as the tape really stayed in place while still be very flexible. The tape had a smooth, natural feel, one that adhered well, moved well, and didn’t feel like an overly adhesive tape. I found this tape to hold up well against most of my training and sweat. Personally, I feel that the adhesiveness and the spandex in the tape made this extra durable. The tape help up nicely, stayed in place, and even had some good adhesiveness when time to come off. Individuals who may be looking for a less supportive tape may want to keep this in mind, however for those looking for support (which is why I assume most people wear tape), this could be a good option. The tape comes in various color combinations, anywhere from flat base colors to vibrant, two-tone designs. You can find this tape at most sport retailers, Walmart, and online at Amazon.com. The going price for a roll is $11.99, which is not only one of the least expensive tapes I have reviewed, but also arguably one of the best values based on price, durability, and support. I found the TheraBand kinesiology tape to be a good, middle-of-the-road tape option at a very fair price. The tape itself offered medium support. While not as adhesive and supportive as synthetic versions, this cotton-spandex tape offered substantial amount of adhesiveness and support for my sweat, heavy, and explosives training sessions. The pricepoint and performance makes this non-synthetic tape personal top choice for supportive tape with a noticeable, yet flexibly feel.